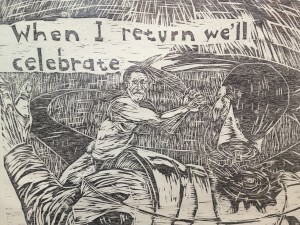 As part of Southern Oregon University’s fALL ARTS FEST/2013 presented across the campus from September 30 through October 5, the Schneider Museum of Art is opening three thought-provoking exhibitions. The Museum will feature noted African American artist Willie Cole with From Water to Light, an installation made of recycled water bottles, and additional sculptures, The Traveler and the Housewife: Deluxe Edition, drawings and vessels created by Daniel Duford during his artist residency at SOU, and Black Manifold, a program of short videos curated by Avantika Bawa and Greg Minissale. An opening reception will be held Thursday, October 3 from 5:00 to 7:00 PM, and the exhibitions will be on view starting Friday, October 4 during the Museum’s regular hours of 10:00 AM to 4:00 PM, Monday through Saturday. 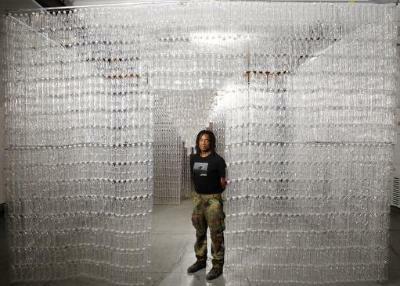 From Water to Light features Willie Cole’s newest artistic obsession: water bottles. With this material he redefines recycling as reincarnation, repurposing over 10,000 recycled water bottles to create chandeliers and rooms filled with a spiritual aura. According to Cole, “From Water to Light pays homage to the natural feminine forces of water, light, and air, and to the earth itself.” The installation consists of 10,000 recycled P.E.T. 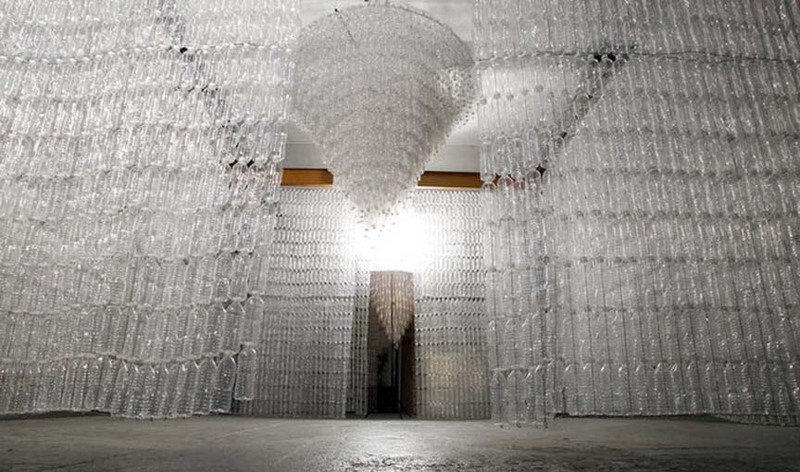 water bottles configured into two chandeliers, each six feet in diameter and seven feet long, that hang in a large room. Rather than ‘recycling’, Cole uses the term ‘upcycling’ to describe his transformation of ordinary domestic and used objects such as irons, ironing boards, high-heeled shoes, hair dryers, bicycle parts, wooden matches, lawn jockeys, and other discarded appliances and hardware, into imaginative and powerful works of art and installations. Through the repetitive use of single objects in multiples, Cole’s assembled sculptures acquire a renewed metaphorical meaning, or become a critique of our consumer culture. Cole’s ‘upcycled’ assemblages challenge viewers to see beyond an object’s function. Willie Cole, a New Jersey native, rose to prominence in 1989, and since then his work has been the subject of several one-person museum exhibitions including: Miami Art Museum (2001), Bronx Museum of the Arts (2001) and the Museum of Modern Art, New York (1998). Cole was one of the featured artists in Reconfiguring an African Icon: Odes to the Mask by Modern and Contemporary Artists from Three Continents, which opened in March 2011 at the Metropolitan Museum of Art in New York. A catalogue of his work, Anxious Objects: Willie Cole’s Favorite Brands, was written by Patterson Sims and published by Rutgers University Press. 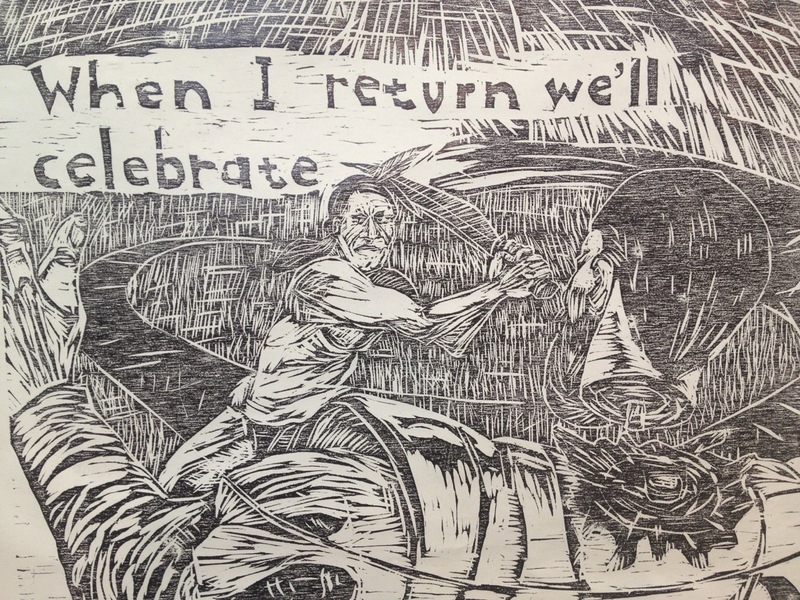 created by Daniel Duford during his Spring 2013 artist residency at SOU’s Center for the Visual Arts. This exhibition and residency was generously funded by The Ford Family Foundation, Roseburg, OR. Daniel Duford is an Instructor in the Intermedia, Illustration and Sculpture Departments at Pacific Northwest College of Art in Portland, OR. Duford’s sculptures and drawings have been exhibited in galleries throughout the United States. His illustration and comic work has appeared in numerous magazines and independent publications. He has self-published graphic novels and posts an on-going anthology on Radio Relay Towers. Willie Cole, The Traveler and the Housewife: Deluxe Edition, work by Daniel Duford, and Black Manifold, a program of short videos curated by Avantika Bawa and Greg Minissale will be on view at the Schneider Museum from Friday, October 4 through Saturday, December 7 during the Museum’s regular hours of 10:00 AM to 4:00 PM, Mondays through Saturdays. The opening reception for all three exhibitions will be held Thursday, October 3 from 5:00 PM to 7:00 PM. Abacela Winery is generously donating and pouring wine for the reception. The Department of Art and Art History, Performing Arts and the Schneider Museum of Art at Southern Oregon University present fALL ARTS FEST/2013 across the campus from September 30 through October 5. The festival features musical and theatrical performances, gallery exhibits and a Blue Flag installation connecting all the of university’s arts activities. “Southern Oregon University has a rich legacy in the arts and with the opening of classes this fall the visual arts and performing arts have come together to present the very first fALL ARTS FEST/2013 to demonstrate what an active arts community exists here,” said Dr. David Humphrey, director of the Performing Arts department. “The festival welcomes students, faculty and the community back to the campus and to its wide variety of arts. See http://sou.edu/performingarts/ArtsFestivalFall2013forweb.pdf for a full schedule of activities.